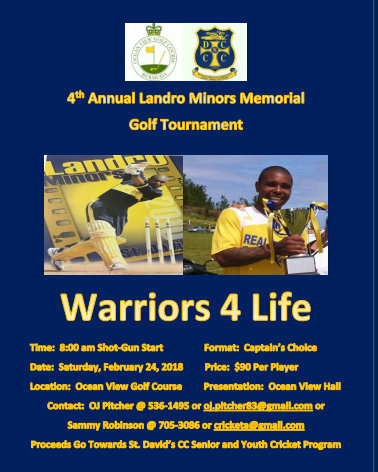 Come February 24th, the St. David's County Cricket Club will be holding the 4th Annual Landro Minors Memorial Golf Tournament at Ocean View Golf Course starting at 8:00am. The Tournament will be played in a Captain's Choice format and the presentation will follow immediately after the tournament in the hall at Ocean View. The tournament has been a complete success every year and promises to be the same this year as we have reached our maximum capacity already with teams from all over the island competing for top honors. Funds raised from the event goes towards the club's Senior and Junior Cricket Programs each year which Landro was a major part of. This year we will see his mother, brother and father hit the first shots off the first tee to officially get the tournament under way.